A rock musician is slowly going insane. He believes that he can be immortal by writing the perfect song. He is pushed along by a ghost who promises to help him. By the end of the movie the perfect song is complete: But is the musician dead or has he gone completely insane? 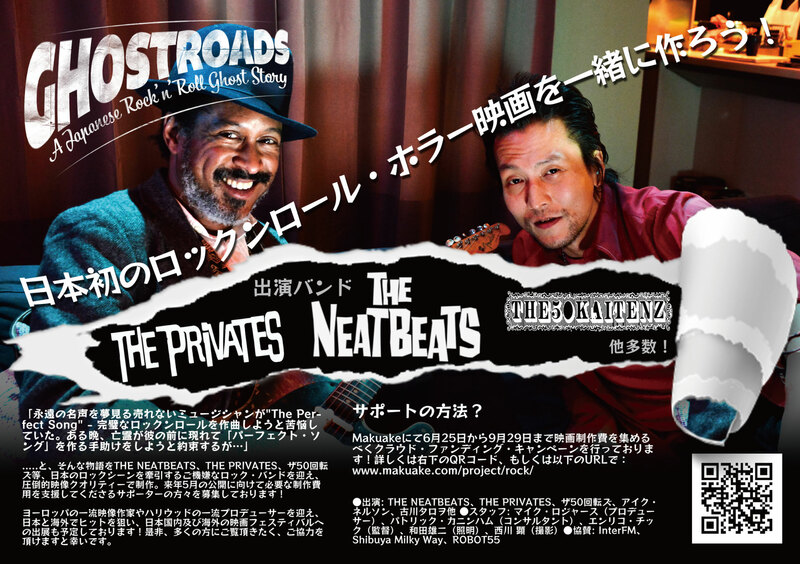 “Ghostroads” will feature some of Japan’s best rock bands, including The Neatbeats (“Japan’s Beatles”), The Privates (“Japan’s Buzzcocks”) and outrageous comedy act The 50 Kaitenz. An innovative team of entertainment saboteurs in Japan is led by veteran Japanese-American producer Mike Rogers. “So, I said ‘Thanks so much. But no thanks for now.’ Rogers’ plan is to crowdfund “Ghostroads” to the editing stage–and he’s halfway there with the Japanese campaign already.